FREE SHIPPING!!! 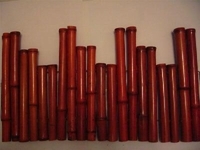 Bamboo Edging in Mahogany color measures 1" in diameter and 12",10",8" in staggered height and each piece is 4ft long totaling 8ft. This bamboo screen fence adds a personal touch that makes it more attractive. At the same time you should stick closely to the exterior of your home so that the garden fencing matches the aesthetic of the rest of your house. Shop for wholesale bamboo fences online today and get free shipping.